A passionate and expressive style coupled with a formidable technique has garnered attention for Simon Powis as a talented soloist, chamber musician and innovator. Growing up in Sydney, Australia, Powis began his studies at the age of five on the cornet. Inspired by his brother’s musical pursuits he took up the guitar at age eleven and began an enduring obsession that would result in performances throughout Europe, Australia and the Americas. After completing his studies at the Sydney Conservatorium of Music with Raffaele Agostino in 2004, Powis traveled extensively throughout Europe to study with some of the world’s most renowned virtuosos. Oscar Ghiglia, David Russell, Pavel Steidl and Aniello Desiderio have had a great impact on the musical style and technical foundation that Powis possesses. In 2006 Powis was invited to undertake a Masters of Music at Yale University on a full scholarship and upon completing this degree he was accepted as the first guitarist in over two decades to undertake doctoral studies at Yale. During his time at Yale the professor of guitar, Ben Verdery, offered instruction, support and guidance that readied him for a career as a professional musician. Powis has toured extensively as a soloist with performances in the Kennedy Center (Washington D.C.), Australia House (London), and the Banff Center for the Arts (Canada). A strong passion for chamber music has resulted in international collaborations ranging from traditional groups such as the Modigliani String Quartet and Ian Swenson (violin) to less common performances with double bass, electronics, and even the tuba. Powis’s openness to innovation is exhibited by his devotion to performing new works. In the past years he has collaborated with a variety of composers to premiere over thirty new works on the concert stage. As a teacher Powis has created one of the most extensive online education sites for the classical guitar, Learn Classical Guitar Online, and has interviewed world renowned musicians John Williams, Oscar Ghilgia and Benjamin Verdery on the site’s classical guitar podcast. 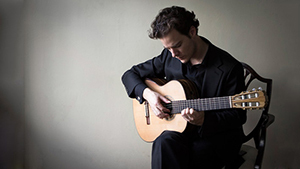 He has conducted masterclasses in Lima, Mexico City, and New York, and at Yale he was employed as both a guitar instructor at the school of music and a teaching fellow in the department of music.